I shopped a few companies for a wood-look carriage garage door and new opener. Patrick was by far the most responsive, and eager to provide a quality product that not only met our needs but kept it within our budget. He was wiling to let us provide the opener and just charge a reasonable fee to install it. He directed me to the manufacturer suppliers of the three makers of this type of door in Portland so I could go to each and look at the doors and hardware to make a decision about which brand would be my preference. I liked the door of one brand and the hardware of another. Patrick was happy to accommodate my preference. He special ordered the combination of door and hardware I wanted. Then his technician Billy arrived to install it just a few weeks later. Billy did an outstanding job of installing the door, setting the laser site on the opener, programming the controls, consulting with me on the location of the hardware and then did a perfect job of cleaning up at the end. He was extremely pleasant to work with and took pride in his work. Cool home maintenance website!! By Lowes. Want to know how to replace or fix something around your home??? Between maintenance appointments! This stuff may help. 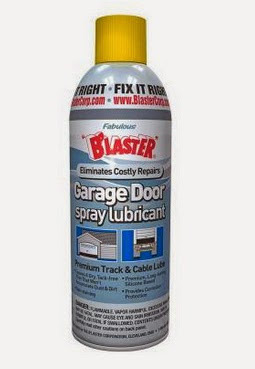 B’laster Garage Door Lubricant is a silicone-based lubricant that leaves a tack-free film that won’t accumulate dust and dirt. In some instances, its extreme pressure agents make it a suitable replacement for grease. It effectively helps stop squeaks associated with garage doors and mechanisms. Yelp Update :-) - Thank you Marc!! Have to take the time to write an additional review for Patrick. Mom accidentally ran into the garage door the other day, buckling the bottom panel. Called Patrick to come out and take a look. He warned me this garage door was discontinued but he thought he might have some extra panels in stock. 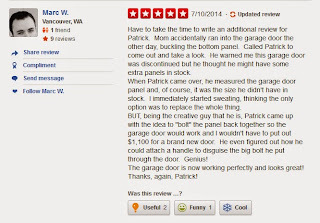 When Patrick came over, he measured the garage door panel and, of course, it was the size he didn't have in stock. I immediately started sweating, thinking the only option was to replace the whole thing. 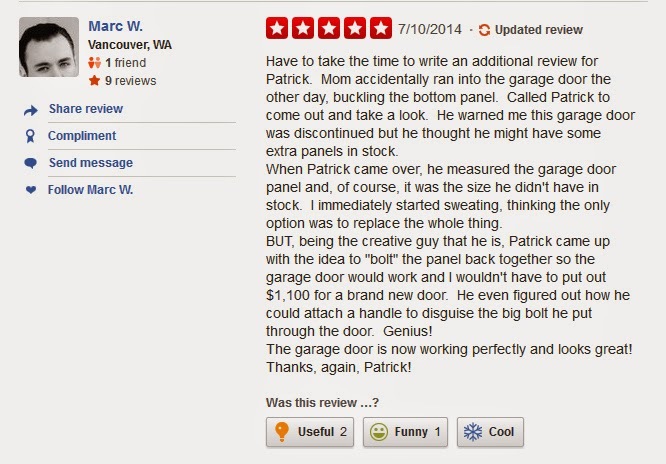 BUT, being the creative guy that he is, Patrick came up with the idea to "bolt" the panel back together so the garage door would work and I wouldn't have to put out $1,100 for a brand new door. He even figured out how he could attach a handle to disguise the big bolt he put through the door. Genius! The garage door is now working perfectly and looks great! Improper use of a garage gate :-) Fail! Residents in a quiet cul-de-sac were shocked to discover a pet cat had been decapitated, its paws cut off and a threatening message painted in the animal's blood on a garage door. Rhonda Gibson, who lives a few doors down from the targeted house on Hazel Court in Arundel, told the MailOnline the Gold Coast suburb is usually very quiet as most of the residents are either retired or young families. When news that a cat had been mutilated a few houses down reached the Gibsons, as cat owners they were very upset. 'Of course that makes you feel ill, but thankfully it wasn't our cat,' Mrs Gibson said. She also said residents in the house next-door to the targeted home told her they felt the force of the fiery car when the explosion rattled their windows and shook their home. There had been no previous trouble in the street, and the residents of the house involved were not known to Mrs Gibson or her husband. 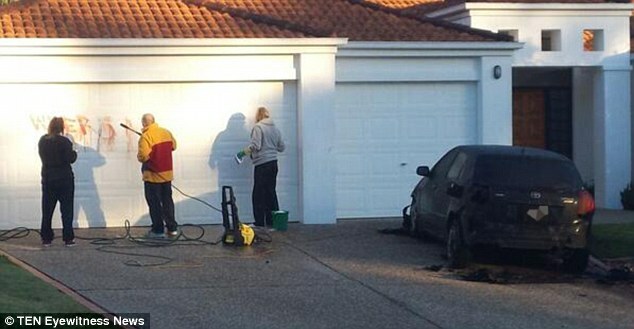 An investigation is underway after a car was also set alight outside the same home in Queensland in the early hours of Tuesday. The torched vehicle, a Toyota Corolla, belonged to the homeowners. 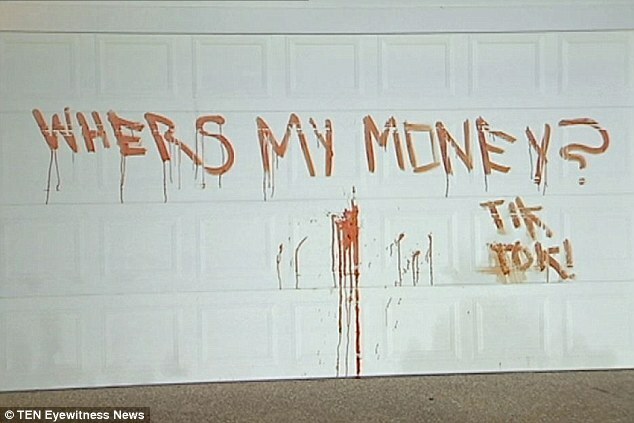 A gruesome message left on the exterior of the house, in what's believed to be cats blood read: 'Whers (sic) my money? Tik Tok!'. Residents and neighbours were woken by a loud explosion around 2.45am and police found the severely mutilated cat near the burning vehicle. The cat's head was left at the front door of the house. People thought to be the homeowners were seen cleaning the graffiti off the garage door later on Tuesday morning. Senior Sergeant William Lithgow from Southport Station told the MailOnline the incident appears likely to be an ongoing matter with the occupants. The cat had been 'decapitated and otherwise dismembered', though the animal did not belong to residents at the home, Senior Sergeant Lithgow said. Detective acting Inspector Greg Aubort said the occupants were disturbed by the message. However, he would not say whether they had an idea who was responsible or if there were likely to be organised crime links. 'We're interviewing the occupants and looking for motives of any persons of interest that might be involved,' he told said. Insp Aubort said given the nature of the incident, police were eager to catch the culprits as soon as possible. 'It's an abhorrent attack on an animal,' he said. RSPCA Queensland has offered a $5000 reward to help catch those responsible for the incident. 'They cannot get away with this,' CEO Mark Townend said. Mr Townend said he feared the offender would strike again. 'It's a stepping stone to violence against people,' he said. Investigations are ongoing and anyone with information have been urged to contact Crime Stoppers on 1800 333 000. We do not transport garage doors like this! 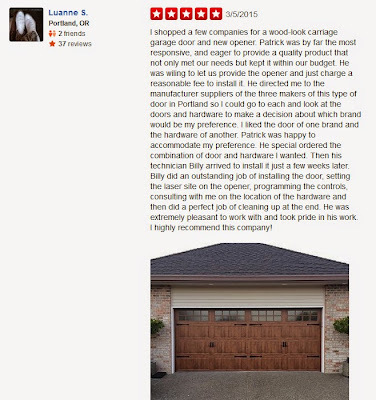 Portland Metro - Vancouver Washington Garage Door Experts!! Those are just a few ways to winter-proof your garage door—if these don’t solve your problem, you may need to consult with an expert. 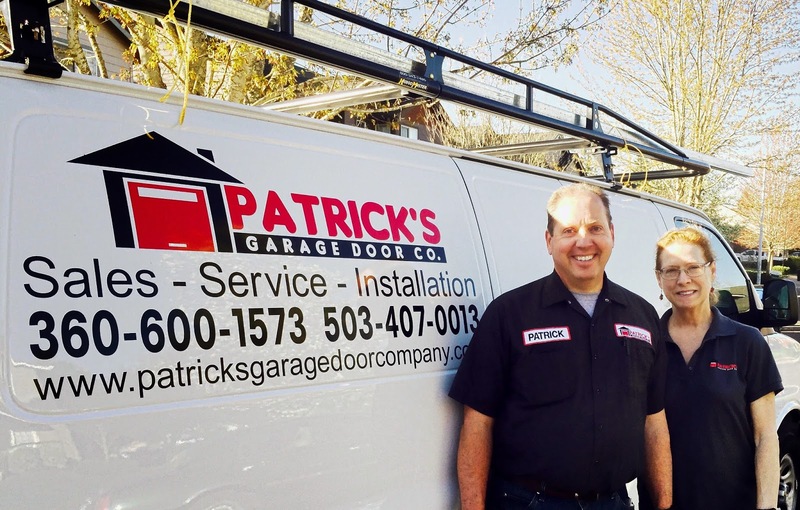 If your garage door is malfunctioning, do not hesitate to contact Patrick's Garage Door Company in the Portland/Vancouver Metro Area. We’ll do our best to identify and fix your problem fast, so you don’t get left out in the cold. Wipe down the weather-stripping and look for cracks that need repairs. 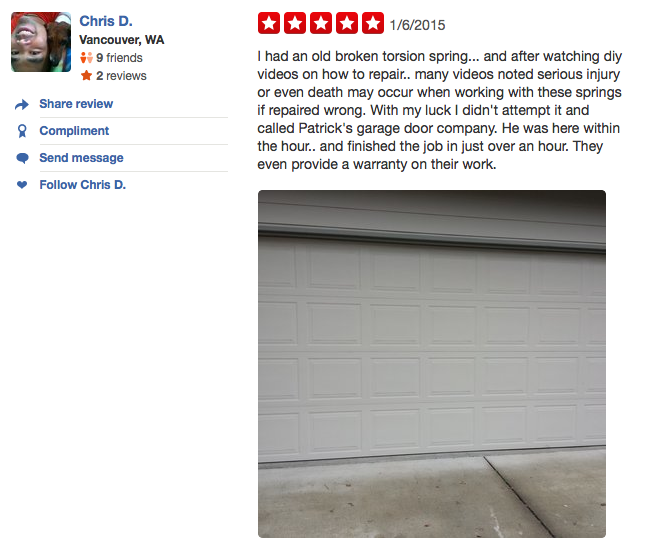 Since you use it every day, your garage door will see a lot of wear and tear over time. Weather-stripping at the bottom of the door can often crack after extended use, which can allow snow and ice inside your garage, thus causing the door to freeze shut. Take a cloth and wipe your stripping down so you can get a good look, and take note of any problem areas, and have an expert help with the repairs. Lubricate all moving parts. Once you’ve cleaned the tracks, use regular grade machine oil (make sure to avoid heavy axle grease) to lubricate the rollers, track, hinges and bushings. These parts can stick and become stalled when it’s cold out, and the lubrication will help get those parts operating smoothly again. When you’re done, wipe away any excess oil to prevent more build-up. Your garage door should actually be cleaned and lubricated a few times a year, so getting into the practice now can only help you in the long run. Remove any gunk or grease build-up on the garage door track. As you use your door more and more, over time, debris can build on the track and rollers, which interferes with how easily it opens and closes. Eventually, your tracks may become so clogged that your garage door can’t open and close at all, which can be pretty inconvenient when temperatures reach those winter lows. If yours is snagged, this could be a likely culprit. Start from inside the garage, and use a cloth to wipe away and remove any grease build-up.